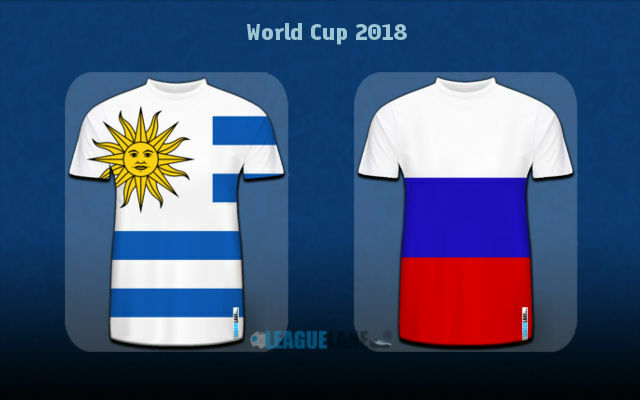 Uruguay and Russia took the maximum of six points from their opening two ties, leaving their head to head affair on Monday in Samara set to determine the group winner. Uruguay and Russia have already qualified to the knockout phase after clinching two wins in their opening affairs against Egypt and Saudi Arabia. They are now to decide the group winner in the third round encounter at Samara Arena. Can the hosts maintain the amazing attacking form and add to the impressive eight-goal tally against the stern defensive line of La Celeste’s? Russia roared to impressive back-to-back wins over Saudi Arabia and Egypt netting an inspiring eight-goal tally in the process. Interestingly, they matched Spain’s total tally in the 2010 campaign, the one which saw Andres Iniesta bagging the tournament winner in the extra-time of the final against Netherlands. Oscar Tabarez’s Uruguay will be the ultimate test for this Russian side who could be regarded as a serious challenge to either Spain or Portugal if they pass the Uruguay test here as well. Even though it’s about the entire team’s success, we have to mention the likes of Denis Cheryshev and Artem Dzyuba who have somehow been the standout figures in the squad led by Stanislav Cherchesov. The first one is one of tournament’s top scorers with three to his name after two games, while the latter added two, a goal against Saudi Arabia (came on from the bench) and Egypt apiece. Uruguay were nowhere near such level having picked up only slender victories against the same opposition so far in the event. Whilst La Celeste had to wait final minutes of the clash against Egypt to grab the three-pointer, the winning goal came much earlier against the Arabians on Wednesday afternoon. It was Luis Suarez who stole the show bagging a goal in his landmark 100th appearance for the national side. He thus became only sixth ever Uruguayan to achieve such accomplishment and also the first one from his country to score at least once in three separate World Cup editions. Luis Suarez scored a goal in his 100th appearance for the national side. Barcelona striker thus became the first Uruguayan to score in three different World Cups. The head coach Oscar Tabarez took advantage of the clash with the group underdogs to test waters in giving away the possession to their rivals. 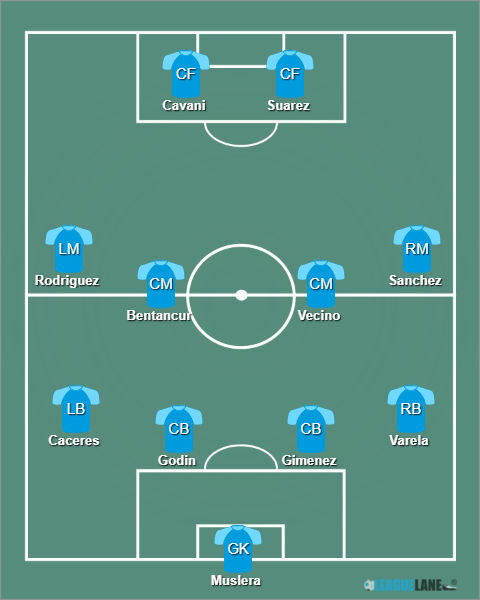 We expect him to use the 4-4-2 formation here with Bentancur, Vecino, Sanchez and Rodriguez in the center of the park. Muslera – Varela, Gimenez, Godin, Caceres – Sanchez, Vecino, Bentancur, Rodriguez – Cavani, Suarez. Alan Dzagoev is the only injured player for Russia and he will not return to feature the tournament. Villarreal’s Denis Cheryshev proved out to be a fantastic replacement having notched three goals so far. Artem Dzyuba scored two and is certainly going to lead the line instead of Fyodor Smolov who only started the first match against Saudi Arabia. Stanislav Cherchesov should make no changes to the squad that defeated Egypt 3-1 on Tuesday. 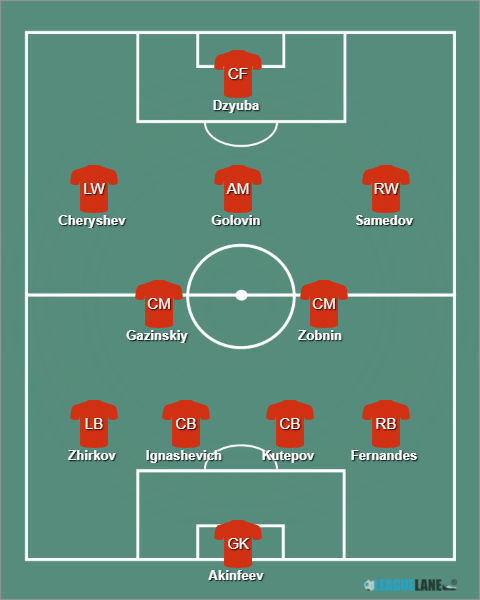 Akinfeev – Fernandes, Kutepov, Ignasevich, Zhirkov – Gazinskiy, Zobnin – Samedov, Golovin, Cheryshev – Dzyuba. The two sides met each other just once in the past. It was an affair of a friendly character, played before the EURO 2012 when Alexander Kerzhakov quickly cancelled Luis Suarez’s opener at the start of the second half to set the final score of 1-1 at RZD Arena in Moscow. Compared to Uruguay, Russia showed much more in the build-up play moving forward in the opening two contests. This will, however, be a whole different affair in which we could see La Celeste at their best for the first time in the tournament. The South Americans are very tough to break down under Oscar Tabarez. The defensive line, consisted of the Atletico Madrid pair of centre-backs Diego Godin and Jose Maria Gimenez, conceded no goals at all in last five internationals. The hosts thus might have serious troubles maintaining their superb attacking form here, while their back line will be heavily challenged for the first time in the tournament as Russia are about to take on the deadly attacking duo of Uruguay’s, Luis Suarez and Edinson Cavani. We thus find the value in backing Uruguay to win at the 2.70 odds. Alternatively, we will go for La Celeste to keep their sixth clean sheet on the trot at the odds of 2.62. Predicted Full-Time Result is a clean sheet victory for Uruguay. Uruguay to win @ 2.70. Uruguay to keep a clean sheet @ 2.62. Correct FT Score: 1-0 Uruguay @ 7.50.